The Secret Diary of Steve Jobs : Fake Steve at Micrsosoft? Oh man I am going to rip his friggin head off! Fake Steve at Micrsosoft? Oh man I am going to rip his friggin head off! 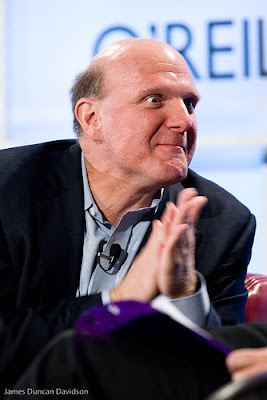 Look at poor Ballmer after someone reminded him that I’d be hitting the Borg campus tomorrow. He can’t wait to get his hands on me. Little does he know I’ll be traveling with a security phalanx. Sorry, Monkey Boy. I know you’re dying to strap Jobso to an Aeron chair and smash it against a wall, but it ain’t gonna happen. And please, no more phony baloney threats about your big patent portfolio, okay? Talk to the hand on that one. Anyway, I come in peace. I’m even bringing you a fake iPod Touch to restore a little sense of childlike wonder to your life. So let’s just keep things civil.